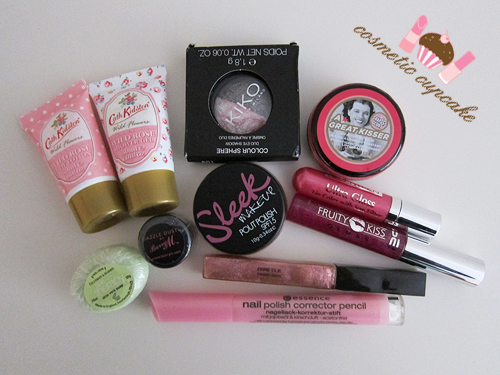 Cosmetic Cupcake: June package love! Last month I received some wonderful packages from 2 of my beautiful friends! First is a very sneaky package from lovely Aysh!! 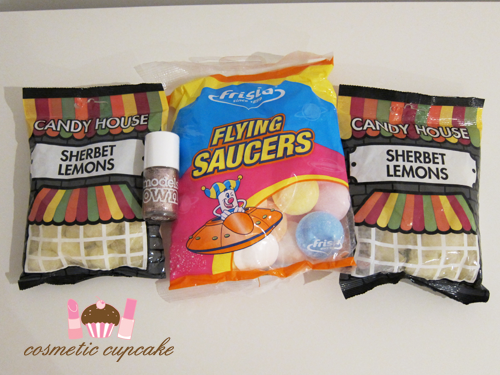 In one of our many twitter conversations about food I mentioned that I adore British sweets and she sent me my absolute favourites - sherbet lemons and flying saucers!!! I literally snapped the pic below and then demolished them LOL. She also included the AH-MAZING Models Own Pink Fizz glitter. You can peep her post about it here! I'm itching to try it out but I'm not in the mood for glitter removal lately haha. Next I received not 1 but 2 amazing packages from my dear Christina!! Seriously how much does she spoil me rotten?? 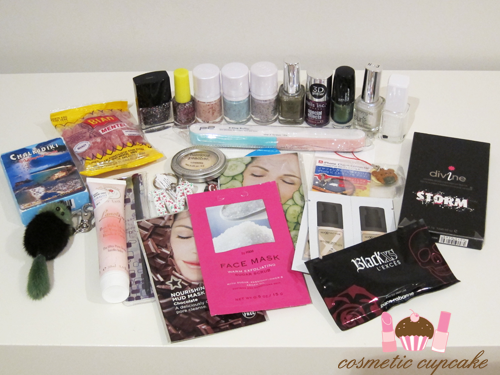 Awesome polishes from Tony Moly, H & M, Erre Due, Nails Inc., A-England! 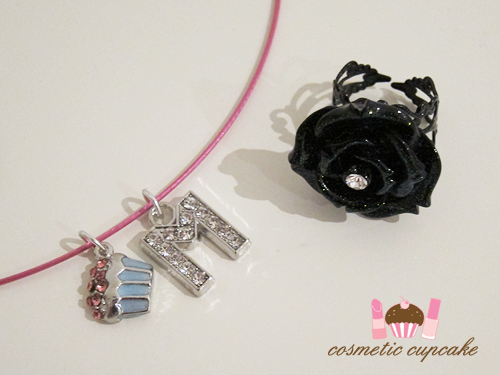 She included 2 beautiful personalised pieces of her jewellery! A sparkly Cosmetic Cupcake necklace (!!!!!) and a gorgeous black rose ring with silver glitter that unfortunately I couldn't capture in my pic. She is amazingly talented and creates so many beautiful pieces - check out her Etsy store Cel's Deconails. Her 2nd package made me nearly fall over in my excitement. HOLO, FLAKIE, GLITTER and DUOCHROME AWESOMENESS. Arghhhhhhhhhhhh! Thank you for killing so many lemmings!! wow! you are one lucky lady!! Loving all the gorgeous nail polishes! I am so blessed to have made such lovely friends through blogging. They spoil me rotten! Oh my goodness! she is so crazy-lovely-nice-spoling haha! Omg brazilian nail polish Hits yayyy!!!! could you show for us this nail polish?? ?